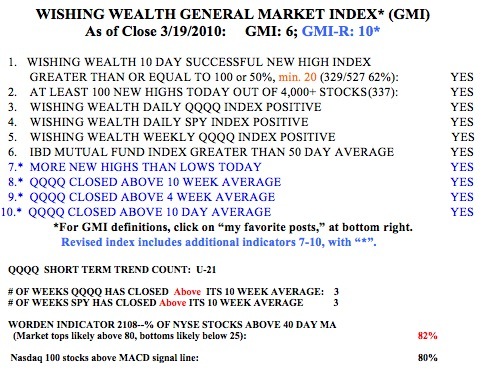 remains at 6 (of 6) and the GMI-R at 10 (of 10), the number of Nasdaq 100 stocks with their MACD above its signal line is now at 80%, down from a high of 93% on March 9. And the short term stochastic is now above the long term stochastic for only 22% of all Nasdaq 100 stocks, compared with 75% on March 10. The MACD and stochastic indicators often show weakness before it shows up in my other indicators. Friday was the 21st day (U-21) of the current QQQQ short term up-trend. I will just sit back and let my stops guard my holdings.